Peter Martin has written a fascinating series of posts on a number of butterflies that can be seen at Fleet Pond – you can see the full list here. Below are the entries for the months of April and May. Perhaps you can keep your eyes out for them once the weather has improved? The Brimstone butterfly is regarded as the “harbinger of spring”, as the male is so noticeable due to its “brimstone” colouring when it flies strongly after its winter hibernation. Females are a more whitish-green and are, therefore, often mistaken for Large White butterflies. This is a particularly good year for the Brimstone, as I have already seen them in the garden on several days. One year, I saw 14 on one day at Fleet Pond Nature Reserve. After courtship, the female lays her eggs singly under a young leaf or on a stem of Alder Buckthorn or Purging Buckthorn. Between April and early July, a single female may lay 200 to 300 eggs. After about ten days, each egg will hatch and the resulting green caterpillar rests along the mid-line of each leaf when not chewing holes in it. Due to its green camouflage, it is often easier to spot the holes than the caterpillar itself. On reaching full size, the caterpillar pupates by suspending itself under a leaf. This too is well camouflaged, until the yellow colour of its wings show through just before the beautiful butterfly emerges. The new generation of butterflies can be seen on the wing from mid-July onwards. Brimstone butterflies can live ten months or more, if we include the hibernation period. They spend the winter in hollow trees among the fronds of ivy, where their colour blends perfectly with the leaves. Odd Commas, Peacocks, Small Tortoiseshells or even Red Admirals may be brought out of hibernation by the warm and sunny days during the mild winters that we now experience, but it is the Brimstone that really demonstrates that spring has arrived. Although a few may have been seen during April, May is the month when there are often lots of Orange Tips flying around Fleet Pond. The footpath from Avondale Road alongside the Brookly Stream is often a good place to see them (see map on About page above). Like a large number of insects and animals, nature seems to make the male of the species more colourful and this is particularly true of the Orange Tip. It is the male that has the splashes of orange on the upperside tips of the forewings. The female upperside is just white, apart from a black edging on the tips of the forewings. Underside hindwings of both sexes are a mottled green in colour. 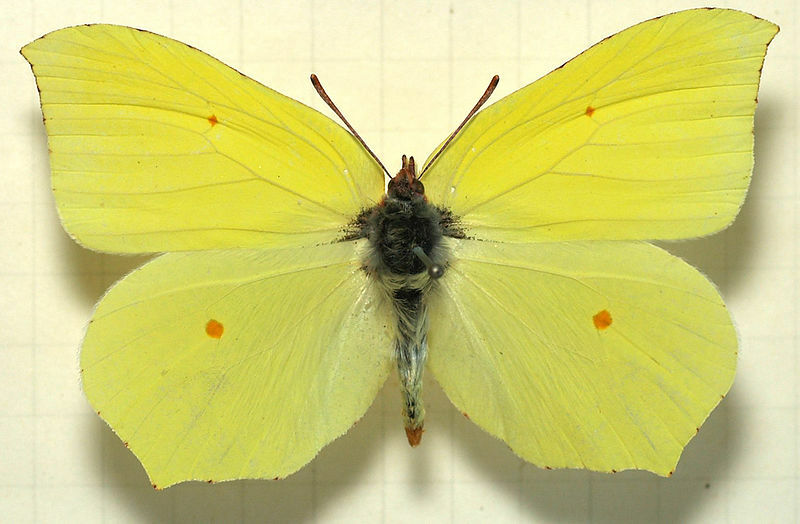 As females have no orange, they may be mistaken for Small Whites, or Green-veined Whites. 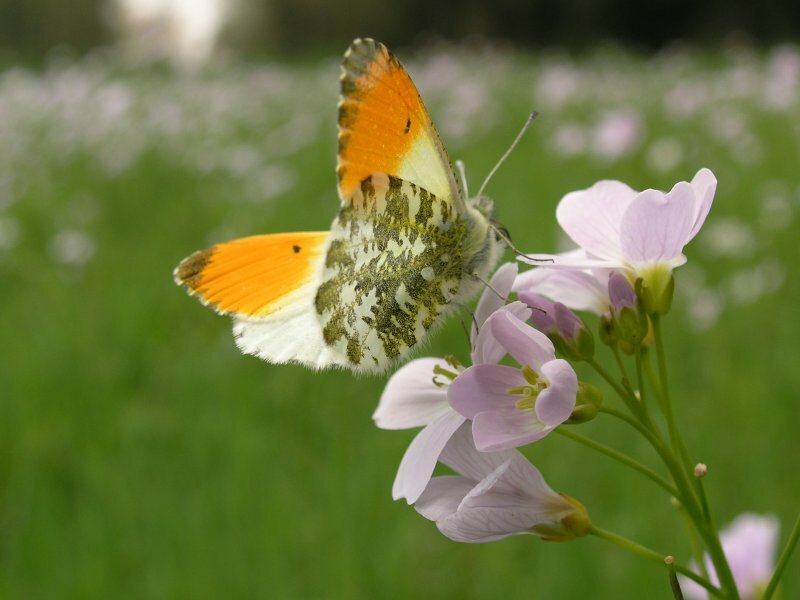 In some years, a few of the Orange Tip butterflies may be miniature – about half their normal size. The orange, lenticular-shaped eggs that are laid at the base of flower stalks on Cuckooflower or Garlic Mustard are unmistakable. As they are not much bigger than pin-heads, however, you may need a focus scope to really get a good view of them. Before emergence, the colour of the eggs tends to pale and when the tiny caterpillars appear they may eat their eggshells, before turning their attention to the plants’ seed pods. As they grow, they may also eat the flowers and leaves and, as they are cannibalistic, even other caterpillars. After about 25 days, they pupate and, with their green hue and strange shape, the chrysalides closely resemble the seed pods of their food plants. Orange Tips remain in the pupal cases until the following spring, when they emerge over a period of several weeks. It always seems a shame that such beautiful butterflies spend most of the year as egg, caterpillar and chrysalid, but each only flies for about 18 days. The first one recorded in my Fleet garden this year was a male seen on 19th April. If you have Honesty growing in your garden, the Orange Tip may lay its eggs on this plant. Peter Martin acted as author for a booklet entitled “Blackwater Valley Butterflies” which contains photographs of all 32 species found in this area together with information about their life cycles. Copies are available for £2.50 plus £1.00 p.p. from Blackwater Valley Countryside Partnership, Ash Lock Cottage, Government Road, Aldershot, Hants, GU11 2PS. (Cheques should be made payable to B.V.C.P.). Picture credits: top and bottom. 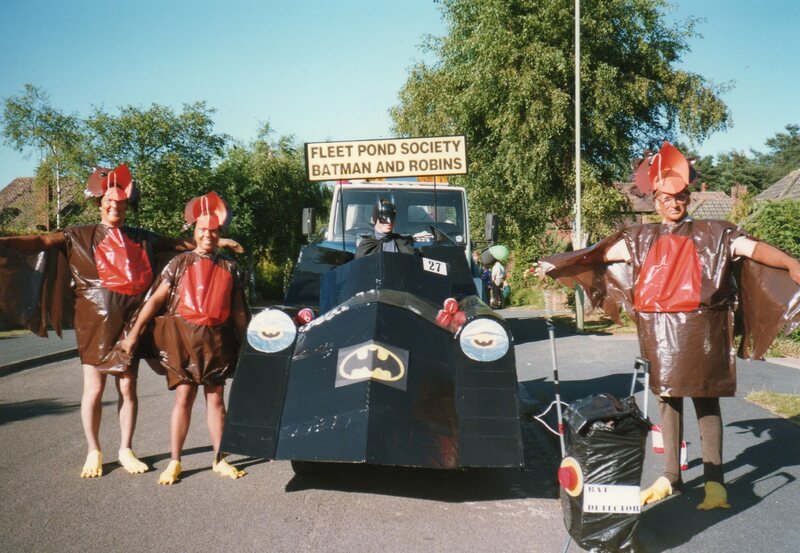 If you’d like to help support Fleet Pond Society in it’s activities, please give a thought to joining (details via the tab above). 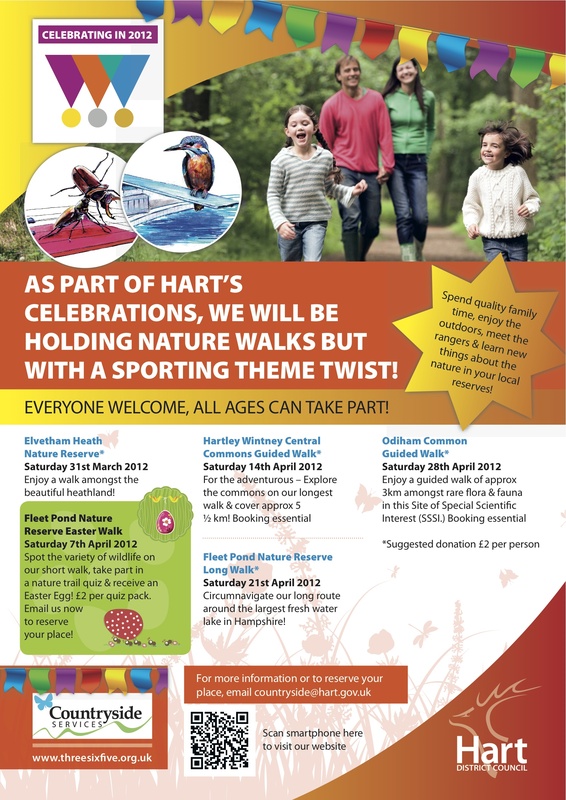 As you can see from this blog, we engage with the local community in a wide variety of ways, with the primary aim of working closely with Hart Countryside Services in the upkeep of Fleet Pond, one of Hampshire’s hidden gems. 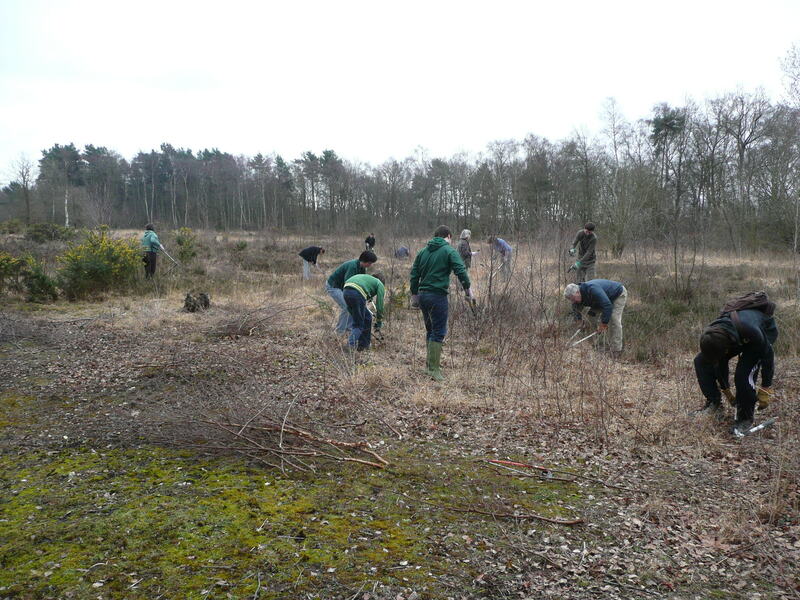 The conservation event for Sunday 11 March was held at the Dry Heath and focused on cutting down saplings (bottom photo) and then burning them. 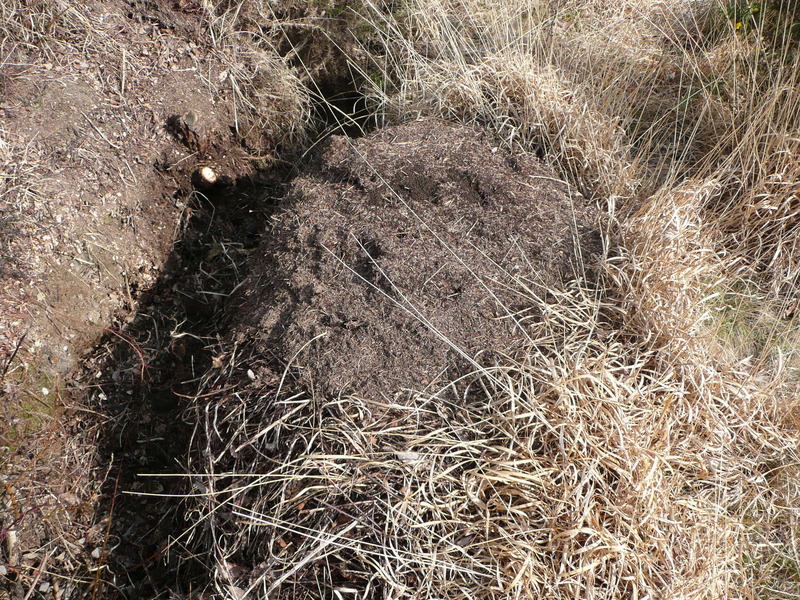 Whilst doing this, an area full of very large ant nests was found (above). 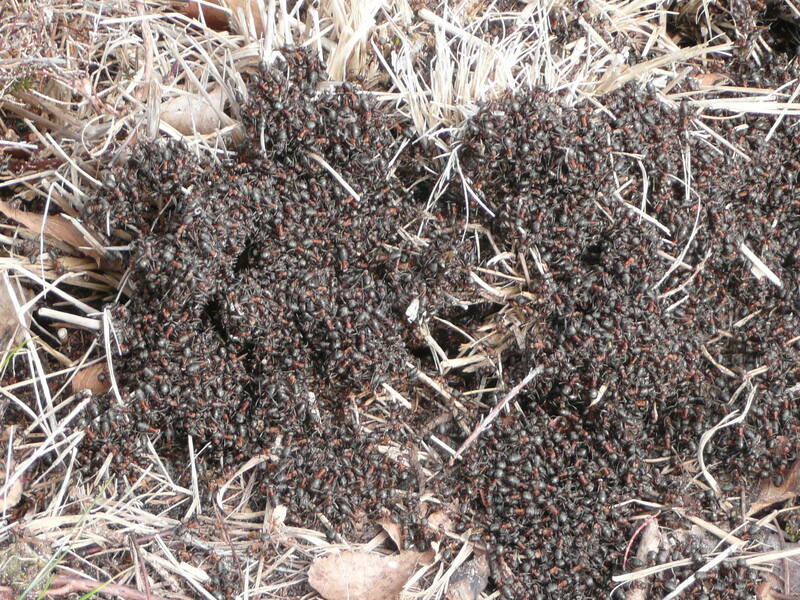 Colin Gray has previously written an interesting article on the Southern Wood Ant at the pond. As I’ve remarked in previous posts, it’s fascinating to find out the background and recent activities of some of the volunteers at our Sunday events. It’s much wider than you might expect! For instance, Alex Bandiera, who’s been with us for about a year now, is an Air Cadet – see also here. 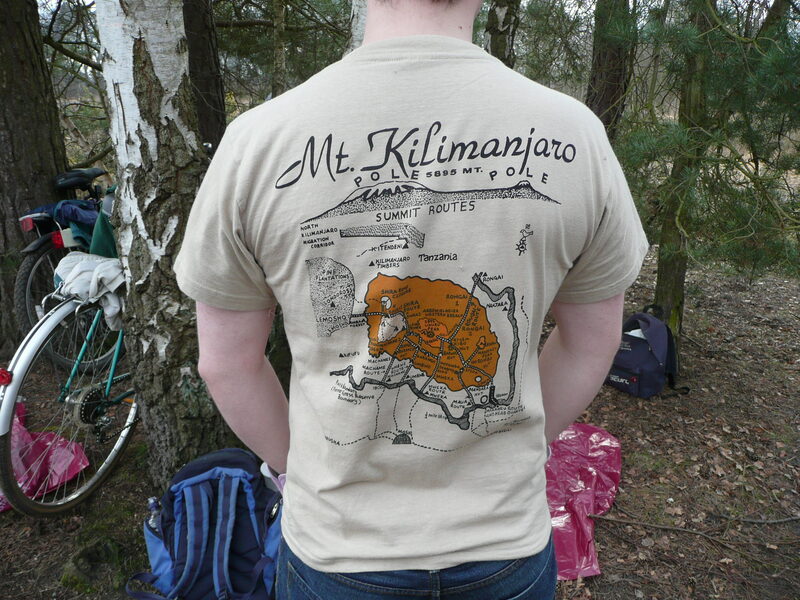 In February of this year Alex and some of his colleagues went to Tanzania for a safari and a hike up Mount Kilimanjaro. This is Africa’s highest mountain (over 19,000 feet above sea level) and is also a dormant volcano. It’s well-known to be a tough climb and many fail – however I’m happy to say that Alex got to the top and has the T-shirt to prove it! However just to reassure you that it’s not all chat at our events, and as mentioned previously, there’s a picture of the volunteers in action below! As you can see, we’re a very friendly bunch, and if you feel like joining us on a Sunday volunteer event you’d be very welcome. 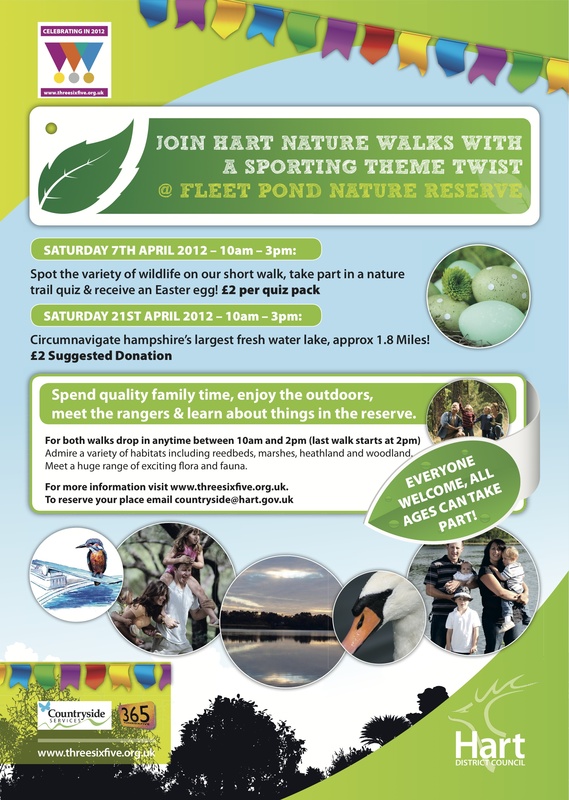 The next event is this coming Sunday, 8 April. 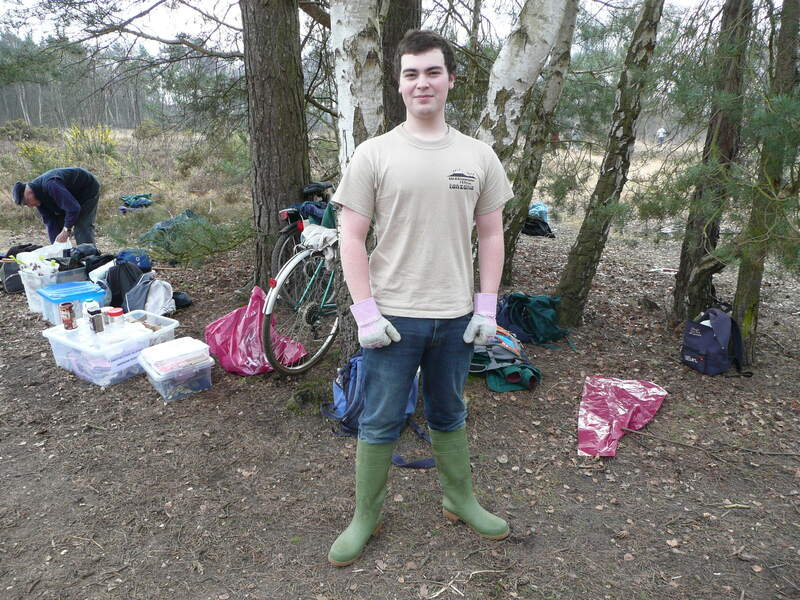 General details of these volunteer events are available here. You are currently browsing the Fleet Pond Blog blog archives for April, 2012.